Georg Layr presented our project at 13. Entwicklungspolitischen Filmtage “Palästina” in Linz after a screening of the documentary 5 Broken Cameras by Emad Burnat and Guy Davidi. Find more info and documentation here. The project provides a set of answer to the needs that emerged during the past few years, particularly in the field of development. Therefore, the project’s activities commenced with a training that represented a fertile debate about the philosophy of research. The activities are carried out in different geographical areas, allowing wider dialogue on scientific research methodologies in light of the Palestinian situation under settler colonialism. The approach used in the project directs the expected studies towards the Palestinian cause and means to reinforce the Palestinians’ steadfastness in their lands against the colonial incursions of the occupation. The yielded benefit was considerable as the project included a range of salient and diverse activities in the context of knowledge development and enhancing the critical and analytical thinking skills of the participants. The most important activity was implementing workshops that discussed many development topics such as youth employment projects. This workshop was concluded with a set of significant recommendations which we hope will widen the prospects of youth employment in the Gaza Strip. Moreover, the project is also expected to include the enhancement of critical thinking among participants in reading development studies. I had a unique experience in participating in a paper submitted for the study day of Human Development Report 2015, and by participating in the preparation team to hold the debate about the role of youth employment projects in advancing development. In the next phase, I anticipate preparing a clear plan for the project along with the participants to identify the future activities that will include the remaining five panel discussions and the remaining training topics to be fully informed of such a plan. I had the honor of joining the rooting development training course and identify scientific research approaches as well as getting to know the trainer. I do really appreciate the opportunity to take part in this great course, with its solid material and highly qualified trainer. The course equipped me with a new and clear knowledge about scientific research approaches and methods as well as knowledge formation. I’m looking forward to gaining new skills in research preparation and correctly employing quantitative methods, in addition to know how to set up critical studies and scriptwriting methodology. Actually, I’m interested in this kind of training specially its focus on development in Palestine, thus; I would really appreciate to give me the opportunity in this training to enforce my skills in this topic or regard. According to my knowledge the method is so special and unique because it will include the practical side and field activities which is really important to make sure that the received information for the participant’s will be in the right and successful way. I’ve learned about the training program, from Dr. Hassan Ladadweh from the social and Behavioral science Department at the university. My desire to participate in this training for several reasons, including: Develop my skills in the preparation of research and social studies, Identify the most important issues of the Palestinian society and social phenomena, understanding deeply the Palestinian situation and exchange of experience and work with all colleagues. Also the supportive team at CDS: Program Coordinator, provide references and accessibility to all resources at the university. 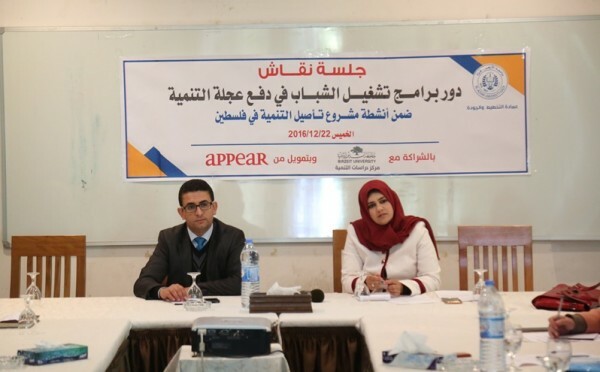 Working towards a new development agenda for Palestine, the project organised a panel discussion at Al-Azhar university to discuss the role of youth employment projects in advancing development. For more in formation in Arabic, click here. The Center for Development Studies (CDS) started to conduct a series of Development Dialogue workshops complementing the discussion at the center had held in the previous week. On the 18th of December 2016 CDS held a first meeting in Al-aqaba village, north east of Tubas city to learn about their development experience. The workshop was held in partnership with local organizations in the village; namely: the Rural Woman Organization, Al-aqaba Cooperative Agricultural Organization, Al-aqaba Development Organization for housing the displaced persons, Al-aqaba Hope and Unity Club, and Al-aqaba Village Council. The workshop was attended by the trainees of the program that targets the MA in social sciences students at BZU, and the program staff: Ayman Abdulmajid and Abaher Alssaqa. The Israeli High Court of justice: the villagers were able to use legal means in order to achieve legal orders in favor of their struggle. Banning the Israeli Occupation Forces (IOF) from entering Al-aqaba with tanks in 2003. Banning the IOF from storming the houses with arms. Donor countries: addressing the donor countries to rebuild the village and combat the demolition alerts. By this, Al-aqaba people were able to build the village’s different organizations, and to mobilize visits of 17 ambassadors from different countries to stand against building a wall that separate between the village and Tayaseer Village. Media outlets: The people of Alaqba were able to use international and local media outlets to gather support for the village and to create international pressure on the Israeli authorities, in order to gain their rights. Until now, the village received about quarter a million solidarity letters, in which different parties expressed their support for the villagers and opposition to the occupation and its policies. The local organizations provided additional information related to the establishment of local associations and economic facilities. During the last years, the residents were able to establish a library that contains around 5000 books, a mixed school from first to the tenth grade, a medical herbal factory (the first of its kind in the West Bank and Gaza Strip), as well as a diary manufacture, two kindergartens for up to 165 children, a hotel that provides residence for foreigners, a and sport club. The five organizations participating in the workshop were also established during this period. These organizations cooperate under the umbrella “Al-Aqaba Village Organizations Union”, while each organization retains its own independent character. They have already had great successes, such as buying agricultural tractors and exporting local products to countries like Kuwait, Saudi Arabia and Venezuela. The workshop has shown the great capacity of local organizations to perform indispensable social and economic roles, to achieve political objectives and generate revenues for the people. The cooperative organization working in housing displaced people was able, for instance, to help three families return to their houses this year, and four families last year. In addition, it helps dozens of families to finish their houses, provides livestock and support in farming medical herbs to families. Another evident positive impact of their work is that women gained working opportunities and were able to have educational possibilities that were previously unavailable. The head of the village council blames the PA and Palestinian businessmen for the fact that they did not offer any support for the village while many international parties did so by providing logistical and financial support. The Center for Development Studies (CDS) held a brainstorming session that discusses the research trends and agendas in relation to development in the colonial context. The session was attended by dozens of academics and students from different departments and specializations. It focused on the structure of the research agenda and the conceptual arguments it triggers. Furthermore, the session tackled the importance of methodological framework developed by the CDS in an attempt to challenge the reality of fragmentation imposed by Israel’s occupation and the widening gap it created between the Gaza Strip and the West Bank. The CDS has been focusing on developing a proper methodological approach to challenge the obstacles and structural impediments to the research process in its various phases, especially in terms of empirical research, surveys and field research, and to therefore to introduce the best possible ways to research the entirety of the fragmented Palestinian communities (in the West Bank, the Gaza Strip,1948 Palestine and the diaspora). Within the framework of the project Rooting Development in the Palestinian Context two project members, Helmut Krieger and Klaudia Rottenschlager from the University of Vienna, took part in the kick-off meetings at the partner NGOs in Lebanon and Jordan. The trip offered the first opportunity for the Vienna-based colleagues to meet in person and jointly discuss the project components with Kassem Sabbah, director of Mousawat in Lebanon and Rahma Abud- Alrahman, director of the Community Development Committee (CDC) in Jordan. Furthermore, Mousawat, CDC and their team members enabled their Austrian colleagues to gain invaluable insight into their daily working conditions, current (research) projects and the political, economical and social challenges for Palestinian as well as Syrian refugees in the region. Mousawat’s headquarter is located right at one of the entrances of Mar Elias, a small Palestinian camp located in Beirut. Mousawat holds its meetings with national and international organizations and donors there, plans its research and activities in supporting underprivileged groups of Palestinian refugees (especially people with disabilities, young refugees and displaced people) and runs its rehabilitation centre, which includes a workshop for prostheses, a physiotherapy practice and counselling facilities. Since the outbreak of the war in Syria, these facilities are one of the only possibilities of Syrian refugees to receive free treatment in Lebanon. As Mousawat is also active in other Palestinian camps throughout Lebanon, Kassem Sabbah could give detailed information about the current situation of the approximately half a million Palestinian refugees in Lebanon and the Syrian Palestinian refugees arriving since the outbreak of the war in Syria. Palestinian refugees are still facing massive and multiple forms of discrimination regarding access to employment, social security and the right of ownership or property and are not entitled to apply for citizenship in Lebanon. Lebanese army checkpoints can be seen today at the entrances to camps like Nahr el Bahred, Ain El Hilweh and Burj El Shamali. One of their functions is to prevent the refugees from bringing building materials into the camp to improve their housing conditions. Nearly all of the camps are overcrowded, lack proper supply of electricity, sewage systems, health care facilities, and employment possibilities, especially for young Palestinians. During the project meeting a visit to Shatila camp with a group of young field researchers from all over Lebanon was organized. Shatila, which was founded by UNRWA in 1959, became a tragic example of violence against Palestinians in Lebanon, not just during the 1982 Sabra and Shatila massacre, but also during inner fractional violence during the Lebanese civil war. The Community Development Committee (CDC) was founded by the legal umbrella of UNRWA in 1998 and is based in Zarqa camp, an hour drive from the capital Amman. CDC leads a coalition of seven NGOs in the Zarqa governorate and coordinates 14 women’s and community centers in ten Palestinian camps throughout Jordan. Following Rahma AbudAlrahman, the director of CDC, and her team during their daily work provided the opportunity to experience the huge bureaucratic and organizational efforts in coordinating different activities and projects within their network. 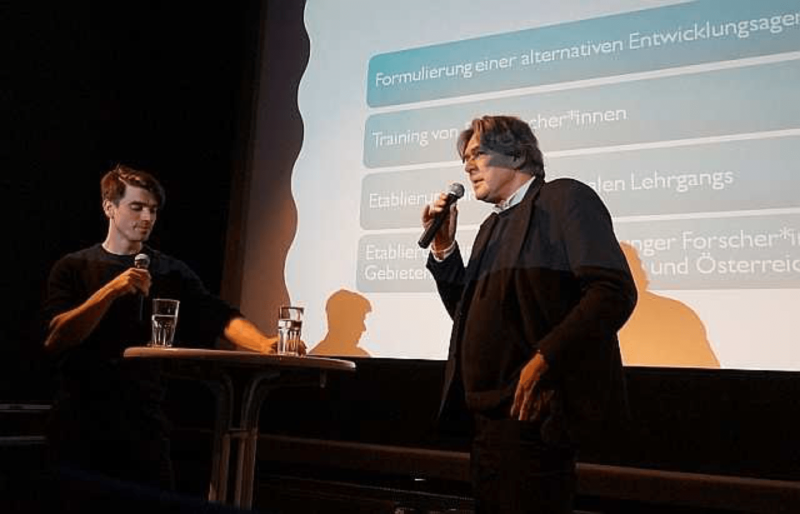 The colleagues from Vienna were also introduced to a relatively new project, a film club that was launched together with the Royal Jordanian Film Commission in order to strengthen movie production about the camps by young Palestinians. Poverty, unemployment and a lack of responsibility by the Jordanian state in providing public services are major challenges for camp residents. Although Palestinian refugees in Jordan have the legal right to full citizenship, the system is much more complex and depends on the different historical periods of displacement from Palestine. At the moment, seven different residence categories exist for Palestinians ranging from full citizenship and full access to the labour market to different forms of residence denying access to political engagement, work, passport or any status at all. CDC also arranged a visit to Baqa’a camp, one of the largest camps 20 km north of Amman established in 1968. The director of the local community centre explained that the biggest challenge during summer time were rats which are attracted by a lack of properly functioning sewage disposal. Due to the neglect by the Jordanian authorities the local population in the camp had to solve the problem. Furthermore, she mentioned that a lot of young camp residents leave the camp due to shortages of housing facilities and job opportunities. 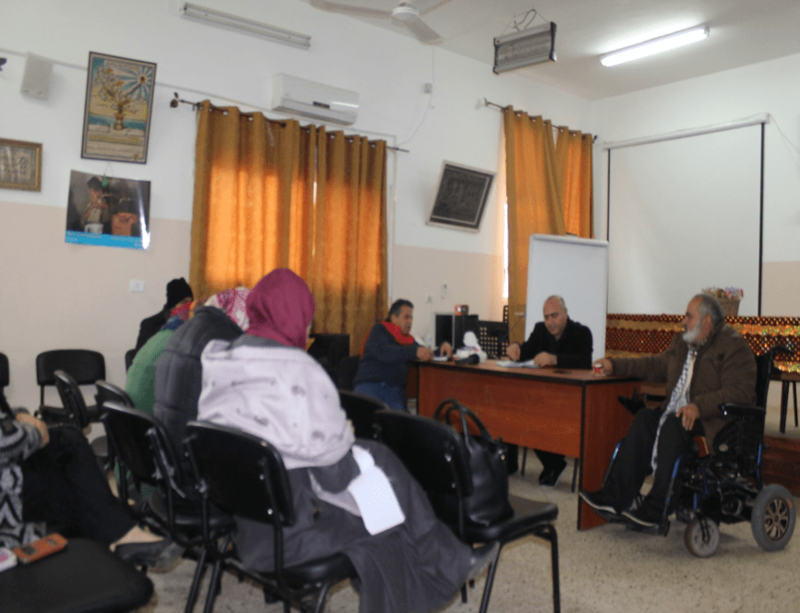 The centre run by CDC provides spaces for the community in Baqa’a camp to hold meetings, to receive different types of training and counselling and attend cultural events. Last but not least, she talked about the challenge to include other communities like labourers from Egypt or South Asia, as well as Syrian refugees within the already overcrowded camp. The project meeting in Lebanon and Jordan provided the unique opportunity to experience the impressive work of the two directors of our partner NGOs which are highly committed to changing the living conditions within their own communities and enabled fruitful encounters and important discussions with the team of Mousawat and CDC. One of the main goals of the project meeting was to discuss the upcoming field researchers’ training of young Palestinians in Lebanon and Jordan. The trainers emphasized the project’s aim to, first, train field researchers to expand their skills in field research and secondly, to strengthen knowledge production by Palestinians about their communities and camps. As all trainers already share long experience in teaching social science methods and are researchers themselves, the meetings provided a rare space to discuss different questions; for example, how to build a sustainable research unit that provides a space for the trainees to gain experience and learn how to develop research questions and methods that are fitting the context. Additionally, the meeting further developed the idea of how to introduce a platform to enable exchange between young colleagues despite their spatial separation, especially among the colleagues in the West Bank and in the Gaza Strip. Last but not least, the Austrian project partners had the rare opportunity to attend the first workshop with the selected field researchers for the training program in Lebanon and in Jordan. Hence, they had the possibility to talk with the participants about their expectations and their experiences in working together with local and international organizations. The vision of the young colleagues coming from different educational backgrounds and different camps in Lebanon and Jordan was clear: they want to work in teams to exchange their skills and to strive for change within their own society. Although the young researchers also expressed doubts due to a huge responsibility in terms of providing money for their families and themselves as well as sometimes continuing their studies beside other job responsibilities, all of them were enthusiastically looking forward to start the training and gain more skills. The project meeting in Lebanon and Jordan enabled all team members to enrich their already well-established relationship. Additionally, the colleagues from Vienna could enhance their understanding of the living conditions of Palestinian refugees in the region. The first kick-off meeting now provides the basis to continue to the next stages of the project for the upcoming years and already inspired future project ideas. The projects research cluster ‘Conflict and Development’ regularly invites interested colleagues to discuss current developments in the Middle East. After a first event in the beginning of April which revolved around – developments in Syria, the latest session questioned the role of Turkey in the region. In the course of the last years both media as well as academia focused increasingly on Turkish foreign and domestic policy. In the center of attention is the involvement of Turkey in the wars of Iraq and Syria, the escalations in the Kurdish territories, the repression of scientists, intellectuals and journalists, as well as the agreement on the regulation of the movement of refugees between the EU and Turkey. Within our Jour Fixe these dynamics and their potential interconnectedness had been discussed. Designed as an open forum, the Jour Fixe is a place to exchange ideas, questions and common reflections. The research cluster Conflict and Development based at the Department of Development Studies (DDS) organized a workshop to “Rethink research in/on Palestine”. Since the Oslo accords, scientific research in/on the occupied Palestinian territories (oPt) has been reshaped by transformative Israeli occupation practices, the implementation of a neoliberal development agenda, and processes of societal restructuring of Palestinian communities. Shifting power relations through conflict and war also highly influenced and reconfigured knowledge production and its political implications. At the same time, many Palestinian scholars have been formulating a longstanding critique on orientalised, Eurocentric and top down research agendas and argue for alternative research methods, methodologies, and epistemologies. What are the main methodological, epistemological, and political challenges we are confronted when researching in/on Palestine? What does it mean to decolonize knowledge production on Palestine? The fruitful workshop was a starting point to establish a network of PhD students and researchers that can be further elaborated due to a lacking of institutionalisation of Palestine Studies at European universities.